Expert or professional tea tasters are some of the highest paid in the tea industry. Why? Because they determine the flavor and hence the grade (i.e. quality) of tea leaves and can indicate what may be the bidding price for such tea at the tea auction. So tea tasting is a great art and can be accurately performed by very few in tea business. 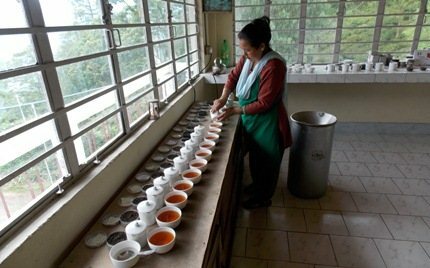 I have had several opportunities of going through tea tasting sessions in different factories in Darjeeling. I am by no means an expert tea taster, but I am also by no means ignorant to flavors and qualities of Darjeeling tea. Below is my experience with a tea tasting session I went though at Singtom-Steinthal tea estate in Darjeeling. The estate is located about 25 minutes drive from downtown Darjeeling and spread across an area of over 1,600 acres. The tea plucked here are black, green and white, and all are premium tea which command top of the line price at overseas market. Right next to the factory, there is a building where the factory office is located upstairs. As you climb the staircase you will reach a fairly large room. The garden manager Mr. Jha sits here on one side. He has over 15 years of experience in tea gardens in Darjeeling and has been working at Singtom for the past couple of years. If you come out to the balcony outside, you get wonderful views of tea gardens all around and the factory right in front of you. At one corner of the office room, a lady was arranging a long row of cups as I listened to the stories of the gardens from Jha and Naveen. She was making and setting up many sample teas so that I could taste different flavors of freshly plucked tea from the gardens here. The lady prepared samples of at least 10 different qualities of tea by pouring hot water from a metallic kettle into several small ceramic containers each having different grades of tea leaves. Can you see the small hourglass? Jha mentioned that the leaves need to soak for 5 minutes and then tea would be poured into the cups. I noticed a small hourglass kept by the window-side. The lady turned it over and the sand inside stared to flow down. When I looked up at her, she smiled and said it's timed for 5 minutes. Jha commented... "The ideal temperature to get the best flavor for tasting is 40°C. So wait for it to cool for a while and then sniff and take a sip from each cup". I was so happy that they were preparing both first flush and second flush tea from Singtom and Steinthal gardens for my tasting. As I was sniffing and sipping one cup after the other, and immersed myself into the flavors, I was remembering the coin which was unearthed during re-plantations in the garden here. It had an inscription on it saying 'chaakh lagdo jeevan', meaning 'Flavor of Life'. This coin has had such a deep influence with the management and staff that it has gone into the logo of the group company owning the gardens, and the words in the inscription have become its company slogan. It was Jha's voice again... "Gulp some hot water to wash off the previous flavor before sipping another cup of tea. And let me know which you think is the best!". It's mainly the flavor that commands price of Darjeeling tea in the market and I was on the spot to give my judgement on grades or qualities. They call this office-room a souvenir shop as well because after going through a tea tasting session yourself, you can buy some tea of your choice with flavor you liked the most. They keep packaged tea from their gardens here. Note that you won't usually get Singtom and Steinthal tea in local markets because almost all of the production is exported. The average annual production is about 86,000 kgs. Expectedly, the production has come down after the gardens here have gone organic, as they no longer use pesticides or artificial chemicals to boost the production.